Computing Research Highlight of the Week (December 2- 9 , 2011): Identifying Similar Images Across Domains. Computers can mimic the human ability to find visually similar images, such as photographs of a fountain in summer and in winter, or a photograph and a painting of the same cathedral, by using a technique that analyzes the uniqueness of images, say researchers at Carnegie Mellon University's School of Computer Science. 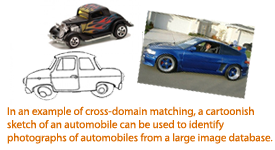 The research team, which will present its findings on "data-driven uniqueness" Dec. 14 at ACM SIGGRAPH Asia, found that its surprisingly simple technique performed well on a number of visual tasks that normally stump computers, including matching sketches of automobiles with photographs of cars. Most computerized methods for matching images focus on similarities in shapes, colors and composition. That approach has proven effective for finding exact or very close image matches and enabled successful applications such as Google Goggles. But those methods can fail miserably when applied across different domains - photographs taken in different seasons or under different lighting conditions, or in different media, such as photographs, color paintings or black-and-white sketches. One problem is that many images have strong elements, such as a cloud-filled sky, that may have only superficial similarities to other images. The researchers hypothesized that it is instead the unique aspects of an image, in relation to other images being analyzed, that should be used to match it with similar images. On the pixel level, a photo of a garden statue in the summer or fall will look very different than the same statue photographed in winter. But the unique aspects of the statue remain constant, even across domains. The team computed uniqueness based on a very large data set of randomly selected images. Features that are unique are those that best discriminate one image from the rest of the random images.